Solving Maths puzzles is very much fun. From last few days, I am publishing some of the Mathematical Brain Teasers which you will love to solve. 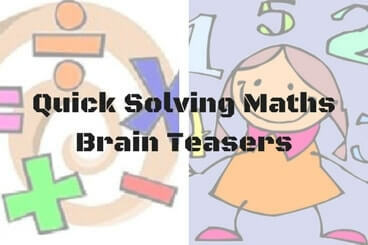 Today's post contains quick solving Math Brain Teasers for kids. Kids will enjoy solving these puzzles. However, teens and adults can also enjoy solving these math puzzles if they try to solve these puzzles in mind and not to use a pen or pencil to calculate the solution. Answers to these quick math puzzles are provided at the end of this post. Please do post your answers in the comment section of this post. P1. If 485= 324062 , 572= 351449 , Then 690=? P2. If A = 46, B=50, C=54, Then D=........., E=.............? P3. If A⁴=14, B⁴= 78, Then C⁴= .......? P4. If X+Y = 14, X-Y= 14 FIND X ÷ Y=? P6. If 134=1916, 245= 41625, 356= 92536, Then 467= ......., 578 = ..............? 1. Easy Maths Puzzles Brain Teasers for Kids with Answers: Let us start with some easy Maths Picture Puzzles which kids will love to solve. 2. Mathematics Logic Brain Cracking Problems with Answers: These are the Maths Brain Teasers which will test both your Mathematical knowledge as well as your logical reasoning. 3. Maths Brain Teaser Questions and Answers: These are very interesting Maths Brain Teaser Questions in which five numbers are grouped together which follows a certain pattern. Your challenge is to find this pattern and then solve for the missing number. 4. Interesting Maths IQ Riddles for Kids and Teens With Answers: Here are very good and interesting Maths IQ riddles which will help school going kids and teens in their studies. Answers of these interesting math brain teasers are given below. I have hidden the answers to these riddles. Do select the text between the numbers to watch the answer of the corresponding riddle. So ans came is 324062. Explanation: add 4 in previous answer. Explanation: A⁴= 2⁴-2, B⁴=3⁴-3 so following the same pattern C⁴=4⁴-4=252. 1² +2²=5, 2²+3²= 13, 3²+4²= 25, 4²+5²= 41, 5²+6²= 61, 6²+7²= 85,8²+9²= 145, 9²+10²= 181.